includes two Assault squads each with two Motorcycle Pioneer Rifle teams & two Large bases. 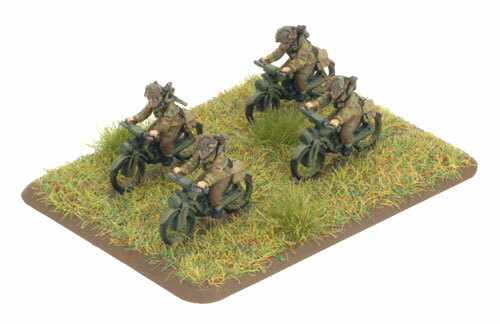 The ‘Blitz Troop’, as the assault platoon was commonly known in the regiment, provided the commander with a motorcycle-mounted infantry force able to keep up with the light tanks, and then dismount to clear obstacles and assault troublesome anti-tank guns. Overlord is the latest compilation release for the Allied forces during the Normandy & Brittany campaigns from June to September 1944. The troop rode into battle upon the lightweight 125cc motorcycles such as the famous Royal Enfield ‘Flying Flea’. This motorcycle was so light that it could be lifted over obstacles, but so small that it only carried the rider and his personal kit, making one motorcycle per man a necessity. 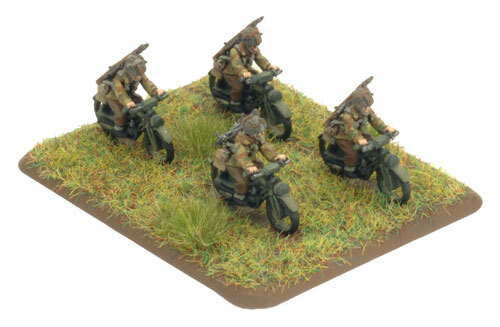 The Motorcycle Pioneer Rifle teams of an Airborne Assault Platoon use the Motorcycle Reconnaissance and Solo Motorcycles rules on pages 196 and 197 of the rulebook. 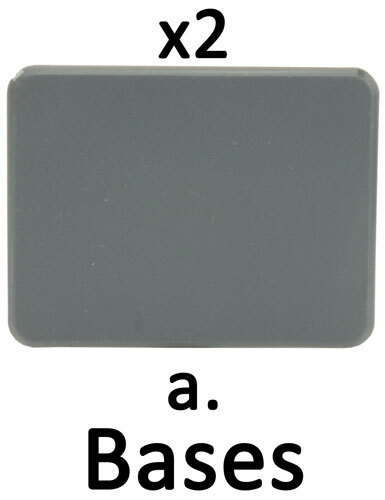 Pioneer teams are rated as Tank Assault 3.
a. 8x Handle bars / Rider arms. d. 8x Royal Enfield ‘Flying Flea’ motorcycles. Each Assault Squad is made up of one Motorcycle Pioneer Rifle team; each team contains four motorcycles complete with riders. 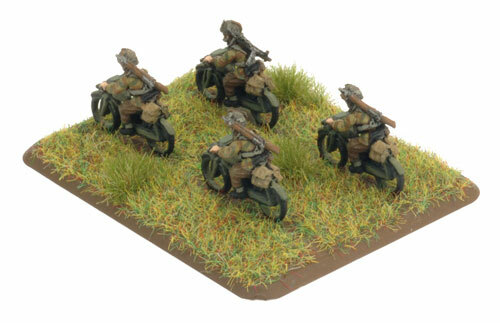 To represent an Assault Squad correctly in Flames Of War, one rider needs to be a NCO (figure / torso B) armed with a STEN gun and the remaining three riders are armed with a Lee-Enfield No. 4 rifle (figure / torso C). 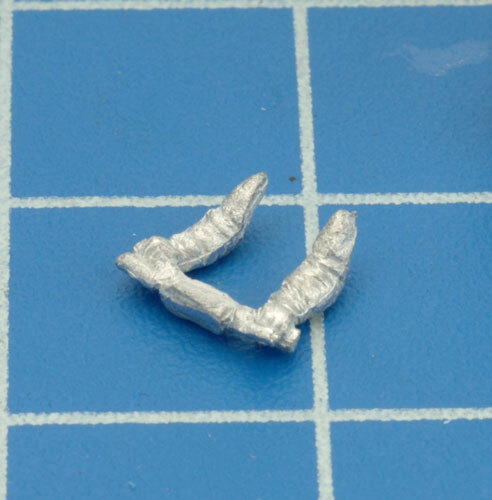 The Assault Squads are based on the Large bases provided in the blister pack which contains enough figures to model two complete Assault Squads. Step 1. 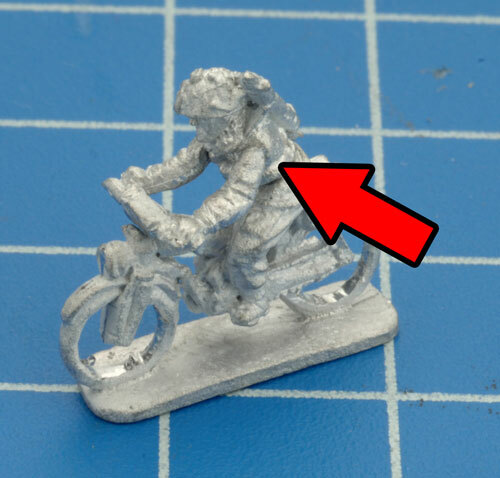 Each motorcycle has a male connector on the which the female connector located on the rider torso can be attached. 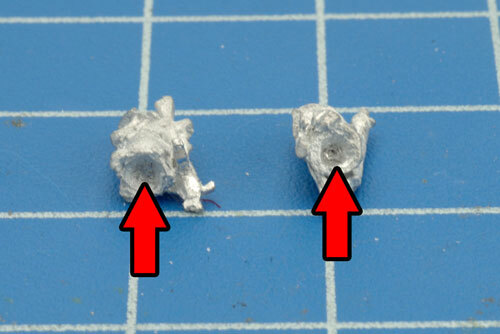 Below: The female connector on the base of the rider torsos. Step 2. 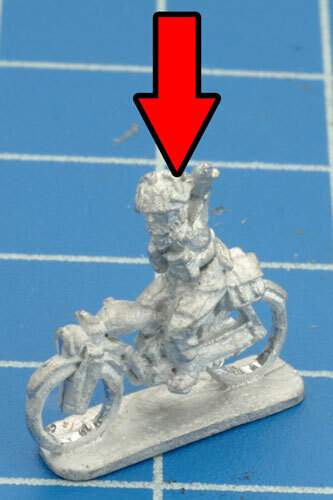 Attach the rider's torso to the motorcycle. Step 3. 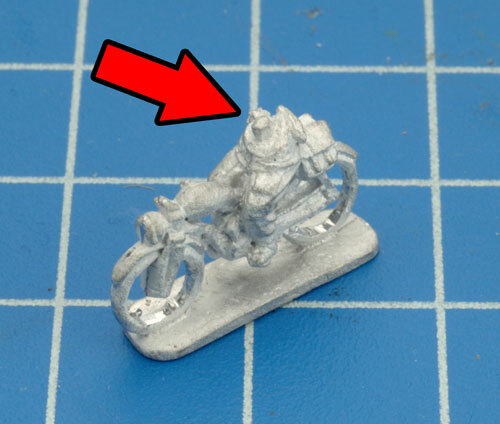 Next, attach the handle bar / rider arms combination to the front of the motorcycle and the sides of the rider's torso. 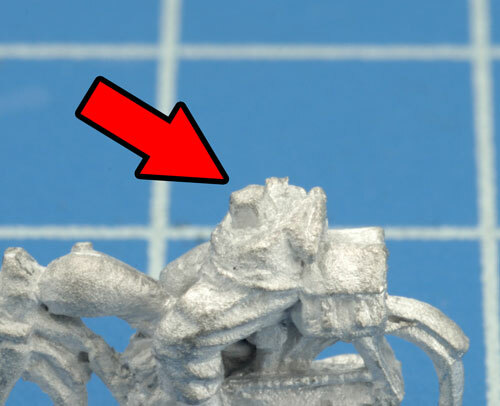 Below: The handle bars attach to the front of the motorcycle. 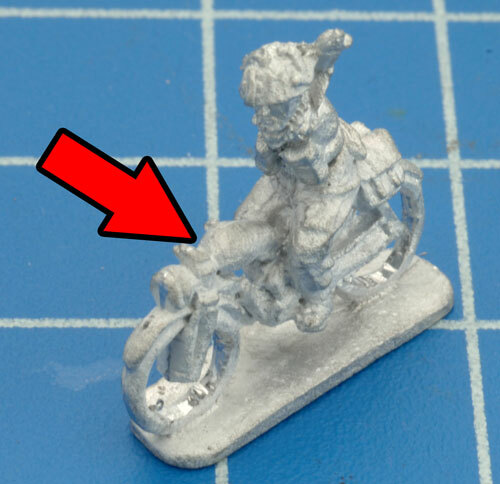 Below: The arms positioned correctly on the rider's torso. Tip: Be sure to dry-fit the handle bars / arms to ensure proper positioning before attaching them permanently. 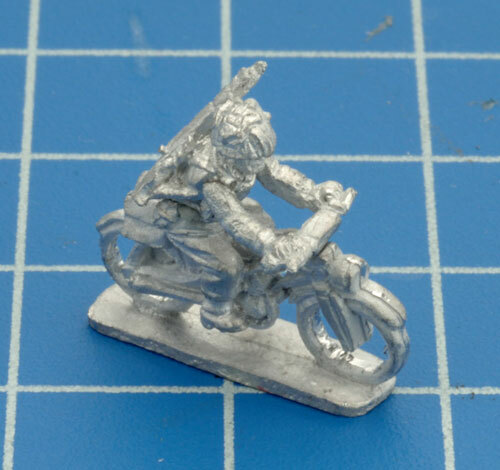 Below: With the handle bars and arms positioned correctly, the Royal Enfield ‘Flying Flea’ and rider are fully-assembled and ready for the painting table. 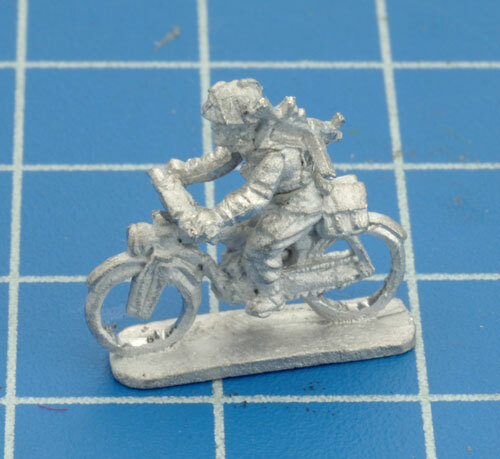 In the example below is a rider armed with a Lee-Enfield No. 4 rifle. Below: An example of a fully-assembled NCO figure armed with a STEN gun.